It only takes about an hour to drive from here to The Hague. Its a really nice city, Dutch center of government, home of many embassies and diplomats, site of the wonderful Peace Palace, a truly international city. And this extends even to the yarn stores! 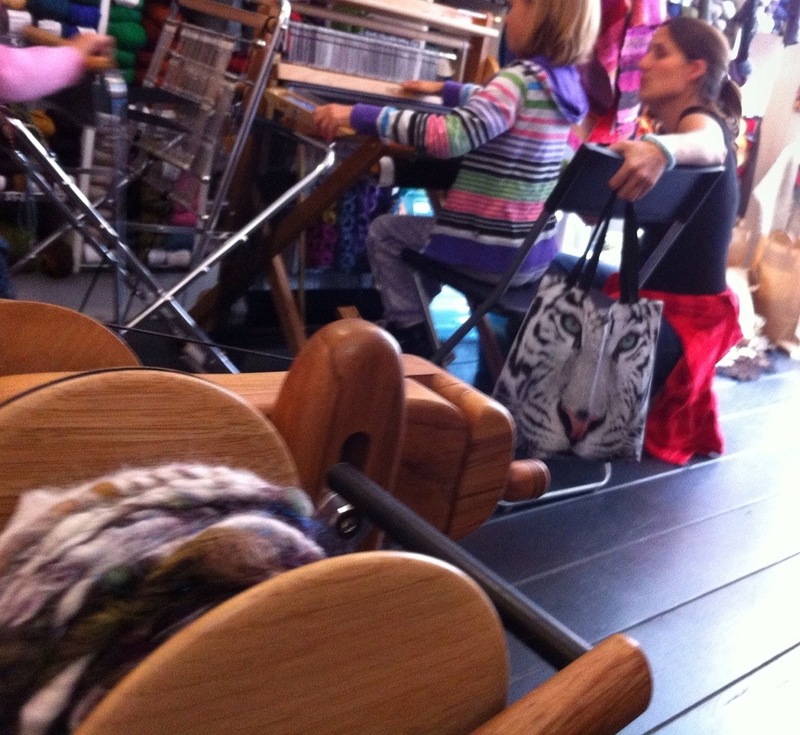 Woool is a lovely little shop packed with fibery goodies and creative activities, Pauline runs regular workshops and knitting groups, and she has a great eye for colour, its a visual feast as soon as you walk off the narrow street and into this cosy shop. And today it was truly an international hub of creativity. During the open day today the shop was buzzing with activity, I found myself speaking to people from all over the globe, UK, US, Holland (of course!) I heard a South African accent, me the only Kiwi, and did I hear a Scottish lilt at some point? And the focus of the day, fibery creations. There were people poring over knitting patterns and books, discussion about stitches and designs, others browsing the yarns and making their selections, and there was a lot of interest in the activities of myself, doing some corespinning from a multi-mixed up batt, Victoria Logan was there with her stunning animal creations ( http://www.victorialogan.co.uk) Andre was spinning on his Louet, from various bags of raw wool originating from, among others, the Dutch Blauwe Texelaar breed, and Patty, with her wonderful Saori looms, a great attraction that took everyones interest young and er, less young! 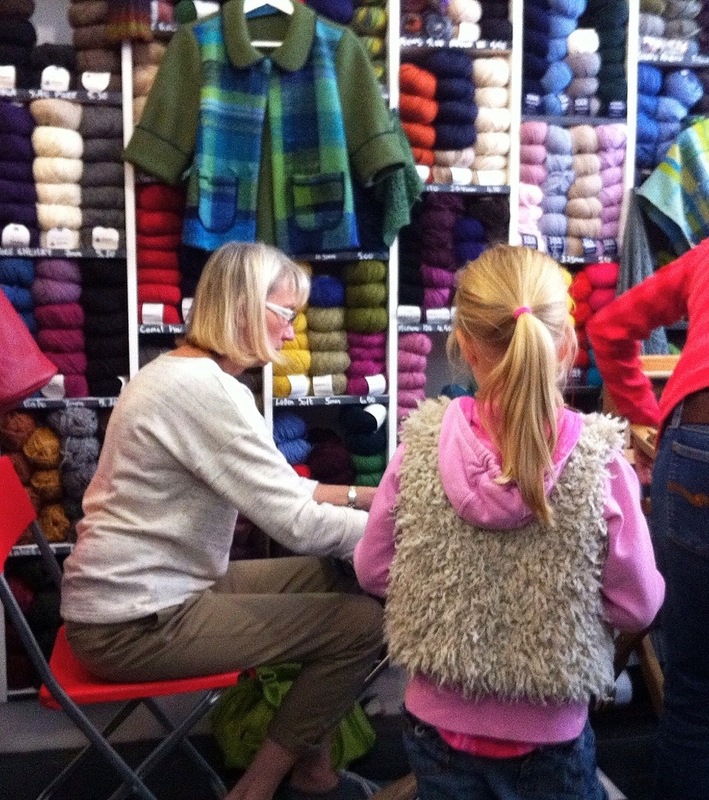 In the above picture you can see Patti demonstrating the Saori Piccolo loom, it was a major hit with the kids that had come along with their mums, and it was impressive to see how fast they picked it up and started creating fabric! 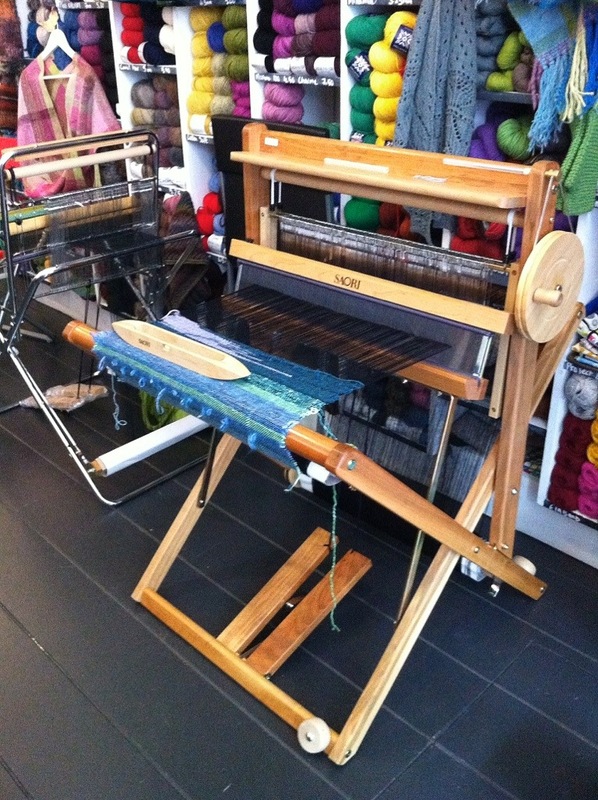 I am quite seriously wanting this loom pictured below, (this VERY LOOM) to be my own. See my name written all over it? SEE? Anyway, I did more than just drool over the loom, really! Here is the proof! Above is my spinning from the afternoon, a soft and super bulky chain ply (navajo ply) made from one of my batts, which I especially packed with extra sparkle! 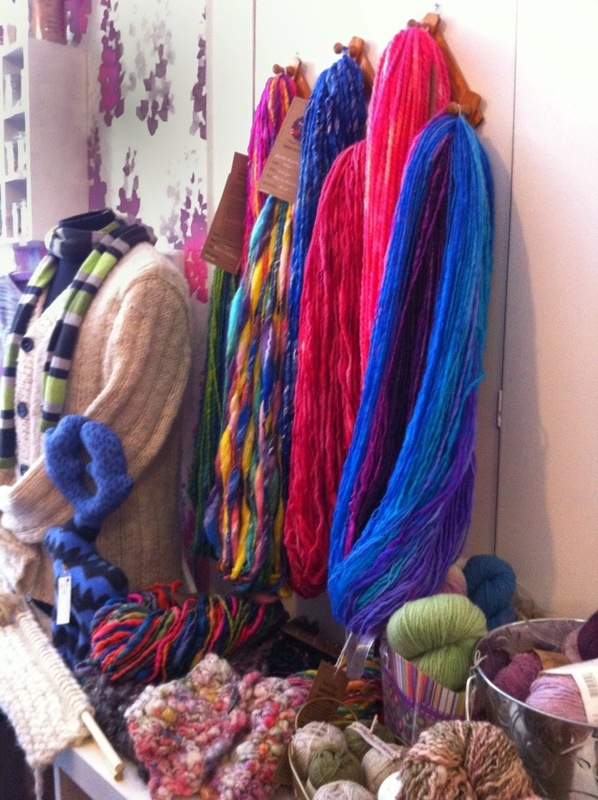 And here below, are some of the yarns that are now in stock at Woool, hanging on the wall! I do believe there were some sales involving my yarn, and some batts too I think, and I know Pauline (Woool owner) has nabbed the big puff thick and thin red yarn to knit something herself with, and I can’t wait to see how that turns out! Thank you to everyone who came and made it a great day, and thank you Pauline for hosting it! 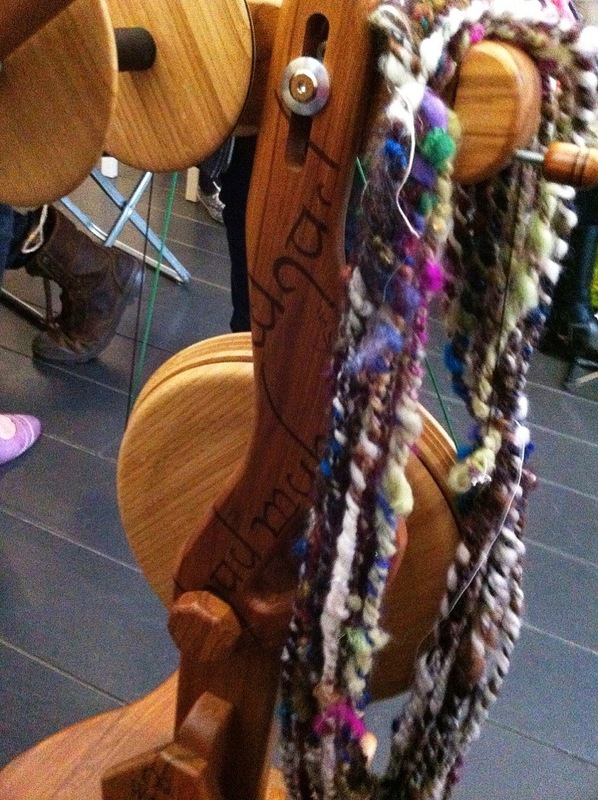 I hope we can do this again sometime later in the year, and, as a heads-up for later, keep an eye out for a “WoolWench Workshop” announcement with a possible Woool venue! How cool would THAT be?! Pauline and I will be discussing the possibilities very soon! I see Maori, its also a kiwi, so yes, its is your name on there. Let us know when the next open day is, maybe i will come for fun! I, too, see your name on the loom!! It looks like the perfect width for making garments as well as smaller items. Your yarn is so beautiful. You have a great hand with the dyepot!! Thanks Elaine! I am having so many ideas for weaving with my yarns on this loom 🙂 The potential combinations of colours, textures, and drape, really have my mind racing! I would like to make scarves and wraps, but also bags and other accessories. But first, shop re-stocking is the priority, and I will certainly have my hands in the dyepots this week! !